The Genode project is back with the feature-packed release 10.08, set out to bring device support of the Genode OS Framework to the next level. Our road map hinted at two particular spots of activity, introducing wireless networking and enabling hardware-accelerated graphics. To pursue the first goal, we pushed the boundaries of our Linux device driver environment by porting Madwifi to Genode. When it comes to hardware-accelerated graphics, today the Gallium3D protocol stack and the corresponding GEM GPU drivers are the state of the art on Linux and other UNIX-like operating systems. With the current release, we make this powerful graphics architecture available on Genode, including support for hardware-accelerated 3D graphics on Intel GMA GPUs. But we haven't stopped with our device-driver related activities here as we introduce a new ATAPI driver accommodated with an ISO9660 file-system implementation, and we largely revisited our existing driver base. Apart from device-driver support, two major features of the release are the upgrade of the Qt4 framework from version 4.5.2 to version 4.6.3 alongside with many performance and stability improvements, and the added support for dynamic linking on ARM platforms with both the OKL4 and Codezero kernels. Gallium3D is the most modern and most actively developed open-source software stack regarding hardware-accelerated graphics. It is mainly deployed on Linux but it has been ported to other operating systems such as the BSD family, OpenSolaris, AROS, and now Genode. In the following, we will first provide a little background about Gallium3D followed by a rough overview on how its components fit into Genode. Gallium3D was designed to displace the long-evolved but inherently insecure direct rendering infrastructure on Linux. With DRI, each application that uses hardware-accelerated graphics has unlimited access to the GPU and its resources such as the frame buffer. To allow multiple applications to use the GPU in a time-shared manner, those applications have to behave cooperatively. There is a central service, the DRM driver in the kernel, orchestrating the applications in such a way that well-behaved applications use distinct GPU resources such as memory and contexts, and so come along nicely. However, there are no effective measures against misbehaving applications. A further consequence of this architecture is the multitude of vendor-specific protocol implementations. Because each application contains an instance of the GPU driver accessing the broad hardware interface of the graphics device, each vendor happened to take a different route for translating graphics APIs such as OpenGL to the actual device interface. Consequently, the code basis for graphics protocol stacks has become extremely complex and fragmented. In contrast, the designers of Gallium3D set out to modularize the protocol stack such that generic code is easy to use by different vendors and the vendor-specific portion of the protocol stack stays as small as possible, thereby lowering the costs for new-device support in the future. In contrast to DRI, a Gallium-based application does not operate directly on the GPU device. Instead, it uses a higher-level abstraction, namely buffer objects for holding data operated on by the GPU. 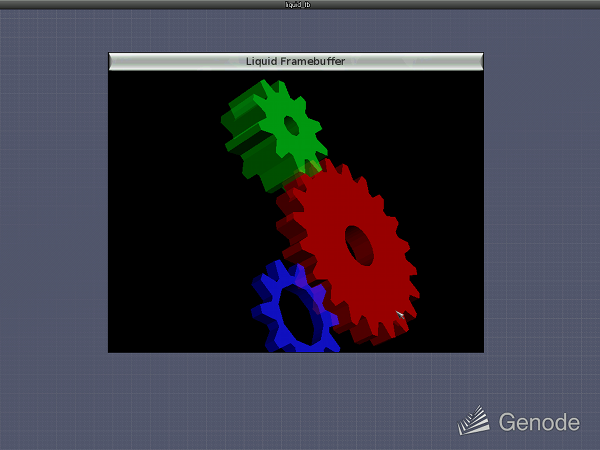 Buffer objects can contain pixels, geometry data, and GPU command streams. The latter type of buffer object can be issued for execution to perform actual GPU operations. The buffer-object interface is provided by a central service called graphics execution manager (GEM) normally residing in the kernel. GEM arbitrates the allocation of buffer objects, manages cache coherency between GPU and CPU, and passes buffers objects containing GPU command streams scheduled for execution to the graphics device. The high-complexity Gallium3D protocol stack is instantiated for each application and acts as a client of the (relatively) low-complexity GEM. Provided that the GPU command stream assembled by a Gallium3D application cannot subvert the operation of GEM, this architecture removes the complex protocol stack from the trusted computing base. Only the low-complexity GEM service must be trusted with regard to security, robustness, and the absence of GPU-based inter-application crosstalk. In contrast to DRI, Gallium3D is perfectly in line with the architecturally principles of Genode. On Linux, the Gallium3D stack communicates with GEM via ioctl operations on the /dev/drm/ device interface. In the context of Genode, GEM should be executed as a user-level device driver and resource multiplexer providing the GEM operations as a GPU session interface by the means of RPC and shared memory. 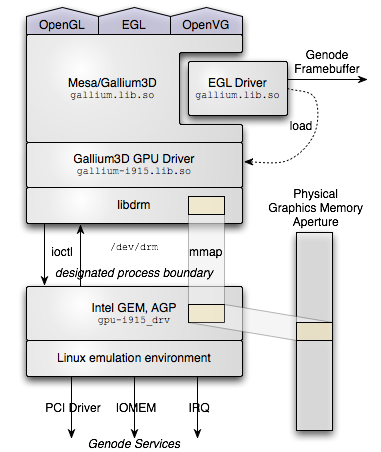 Each Gallium3D application connects to the GPU server and operates on a GPU session. Gallium3D is part of the Mesa OpenGL library. It comes as a set of modules consisting of state trackers (API implementations such as OpenGL), drivers (translating generic graphics commands into device-specific command streams), winsys (the glue between a window system and the Gallium3D application), and a large library of utilities. Most of the code is independent from the actual GPU device as well as the operating-system. On Genode, Mesa-7.8.1 has been incorporated into the libports repository. However, we only use the Gallium3D-related parts of Mesa on Genode. For example, the port does not make use of the Mesa swrast facility for software-based rendering. It rather relies on the Gallium3D softpipe driver. When built, all generic Gallium3D-related parts of Mesa are linked into the single gallium.lib.so library. The following figure gives an overview of how the components of the graphics software stack relate to each other. The components are described in the following. EGL is an OS-agnostic API for managing rendering buffers. The implementation of this API is OS-specific because, among other things, it cares about the interaction of the application with the native windowing system such that the result of GPU-based rendering can be displayed in the GUI. EGL also plays a special role among the Gallium state trackers because it is used by other state trackers. The window-system-specific code is called EGL driver. Mesa-7.8.1 comes with EGL drivers for the X window system and the Linux kernel-mode-switching interface. For Genode, we have added a new EGL driver that uses Genode's Framebuffer_session interface as back end. It is located at libports/src/lib/egl. Because the EGL driver is GPU-independent, it is part of gallium.lib.so. The following screenshot shows the EGL driver in action. We picked Intel's GMA as the first series of supported GPUs because they are well documented and GEM has been implemented first for Intel GPUs. There are two Gallium3D drivers for Intel GPUs called i915 and i965. Currently, we have ported the i915 driver that supports the following GPU models: i915 G/GM, i945 G/GM/GME, G33G, Q33G, and Q35G. On Genode, the Gallium3D GPU driver comes in the form of a shared library called gallium-i915.lib.so. Is gets dynamically loaded by the EGL driver using dlopen. If the EGL driver fails to load the gallium-i915.lib.so driver, it falls back to the softpipe driver compiled into gallium.lib.so. Because there is no build dependency to this shared library, we created a pseudo build target at libports/src/lib/gallium/i915 for the sole purpose of building this library as a side effect. On Linux, the code contained in gallium-i915.lib.so communicates with the /dev/drm/ device interface. However, the interaction with the device is not performed directly but via a library called libdrm. The DRM library is a convenient front end to the /dev/drm/ device. At first glance, replacing this library with a Genode-specific implementation seems natural. However, because libdrm is not only a mere wrapper around the ioctl interface of the device but also contains a substantial amount of program logic and device heuristics, we decided to reuse this library unmodified and go for the ioctl interface as a hook to connect Gallium3D with GEM. Hence, libdrm has become part of the libports repository alongside Mesa. Ultimately, libdrm translates all requests coming from gallium-i915.lib.so to (GPU-specific) ioctl and mmap operations on the /dev/drm/ device. On Genode, there is no such device. In fact, there are no device nodes at all. Instead, we use our libc plugin mechanism to redirect operations on this specific device file to a dedicated libc plugin. When libdrm opens /dev/drm/, the libc plugin located at src/lib/libdrm/ takes over the responsibility of the returned file descriptor. Therefore all file operations on this file handle are handed over to the plugin. This is the point where we can transparently incorporate RPC communication to the GEM service. For now, however, we do not have RPC stub code yet. Instead, we link the GEM code directly into gallium-i915.lib.so. This allows us to implement the GEM-related ioctl operations by calling GEM code directly. For the interaction between libdrm and GEM, we added a preliminary Gpu_driver interface located at os/include/gpu/. GEM is normally part of the Linux kernel and dispatches (a subset of) operations on /dev/drm/. We use the Intel-specific GEM code taken from Linux-2.6.34. This code relies on the Intel-AGP subsystem to manage the GPU's graphics translation table. Therefore, we had to port the Intel-AGP sub system as well. Because GEM is a relatively new feature of the Linux kernel, we decided to not use our Linux device driver environment (currently based on the kernel version 2.6.20) for our porting work but rather went for the creation of a driver-specific Linux emulation environment. The code is part of the linux_drivers repository and located at src/drivers/gpu/. The contrib/ subdirectory contains unmodified Linux code, the i915 subdirectory contains the implementation of the Gpu_driver interface and code for emulating Linux interfaces in a way that the contrib/ code behaves like in its natural execution environment. As an example on how to build an OpenGL application on Genode, the libports repository provides a slightly modified version of the famous Gears demo. You can find the code under libports/app/eglgears/. After having added libc and libports to the REPOSITORIES declaration of your <build-dir>/etc/build.conf, you can building eglgears via make app/eglgears. The build process will create the eglgears executable alongside with gallium.lib.so. You can start eglgears using a plain framebuffer such as vesa_drv. The EGL driver included in gallium.lib.so will try to load a shared library called gallium-i915.lib.so and, if not present, revert to the softpipe driver. If you add the resulting gallium-i915.lib.so to core's ROM service, the EGL driver will attempt to use the hardware driver. Both GEM and the Gallium3D protocol stack are executed as part of a single process, accessing the GPU exclusively. Until we have separated GEM from Gallium3D, only a single GPU-using application can run at a time. Even though a Gallium3D application is able to use the GPU for 3D rendering, the EGL driver relies on CPU-based blitting in order to transfer the rendering result to the screen. Interrupt-based synchronization has not been implemented yet. The GPU is expected to be faster than the CPU. For this reason, the EGL driver waits for 5 ms after each rendered frame. Proper vblank handling is desired. On some platforms, we observed pixel artifacts, which we attribute to cache coherency issues. Resource deallocation within the GEM driver has not been implemented yet. Therefore, we expect that the current version is not suited for highly dynamic applications. The eglgears demo runs fine with resolutions up to 800x600 but we observed unstable behaviour with higher resolutions. Despite of these limitations, the first version of Gallium3D on Genode showcases that a subsystem as comprehensive as Gallium3D plus GEM can be natively executed on Genode. The previous release 10.05 introduced a new configuration concept that enables the specification of mandatory access-control rules among flexible ways to route service requests throughout the system. With the current release, this concept is used by default. We have adapted all example configurations to the new format, polished the new init implementation, and moved it from os/src/init/experimental/ to os/src/init/. The old init variant is still available at os/src/init/traditional/ but it is scheduled to be removed with the next release 10.11. The description of the configuration concept and the XML format is provided by the document "Configuring the init process of Genode" located at os/doc/init.txt. The block session interface extends Genode's range of device-class interfaces by a general-purpose interface to access block devices. It is based on the packet-stream framework, using a single TX-stream to transmit block requests to the server-side. Clients are free to request read/write operations on several sequent blocks at once. Services implementing the server-side of the block-session interface can choose an appropriate block size and the kind of block-operation they support (e.g., read-only device). The new block session interface is located at os/include/block_session/. Both libc and libm are now built as shared objects, reducing the memory footprint for scenarios with multiple libc-using applications. When starting programs that use the libc, make sure to have libc.lib.so and libm.lib.so available as files at the ROM service. Motivated by our work on Gallium3D and libdrm, we extended the libc plugin interface with the support of ioctl and mmap. This change enables us to install custom handlers of those libc calls for a specific file. In the particular case, libdrm performs ioctl and mmap calls referring to the /dev/drm device interface. Now, we can supply a libc plugin specific for a single file. The update of Qt4 from version 4.5.2 to version 4.6.3 required refinements of clock_gettime(), sysctl(), and getpagesize(). Those functions are still dummy stubs but with a meaningful behaviour from Qt4's perspective. During our various device-driver activities, we improved the DDE Kit support library for device-driver developments. The revised handling of I/O memory resources now allows multiple requests of the same resource to support, e.g., multiple Linux ioremap() calls. The I/O memory-mapping type is configurable as uncached or write-combined, and DDE Kit automatically keeps track of virtual-to-physical address mappings. Also, DDE Kit now provides 64-bit integer types and a proper size_t. In order to support shared libraries on ARM platforms, we added EABI support to the dynamic linker and Genode's build-system environment. Thus shared libraries are now supported on Codezero and OKL4 GTA01 targets. This also includes C++ exception handling. Additionally, we implemented libc's dynamic linking interface (dlfcn.h) and are now able to support dynamic loading of libraries by applications via dlopen and friends. With version 10.08, Genode provides a port of the low level ATA/ATPI driver available from http://ata-atapi.com. Currently, the driver supports ATAPI devices only and is implemented as a block-interface server (see Section Block session interface). By default, the driver tries to take advantage of the device's DMA engine but it can also operate in PIO mode as a fall-back solution. According to our roadmap, we introduce initial support for wireless networking. Based on DDE Linux 2.6, a port of the madwifi driver (version 0.9.4) is now available for Genode. This driver supports widely used wifi-cards containing an Atheros chipset (namely: 5210, 5211, 5212). This first wireless networking driver is in experimental stage and doesn't support any form of encryption and authentication on the ieee80211 layer. So you can only use it in conjunction with an unprotected access-point. When started, the madwifi_drv announces a "Nic" session usable by the lwIP stack. We enhanced the PCI bus scanning facility of our PCI driver with regard to multi-function devices and added an accessor function for the physical bus-device-function (BDF) ID. To support a wider range of graphics cards, we revised the VESA driver and support more peculiarities of VBE implementations. Some of these are: unaligned I/O port accesses, dependency on the physical BDF of PCI devices, support for all flavours of PCI configuration space accesses. Even after long years of intensive use, the PS/2 driver is sometimes good for a surprise, which prompted us to improve the keyboard scan code and mouse button handling. The driver fully supports scan code set 1 and 2 keyboards and copes with oddities like "fake shift" events and "yet another scan code for Pause". The current release corrects a shortcoming of our timer driver on Pistachio and Fiasco. Timing on these platforms is now more accurate. Based on the new block-session interface, we implemented a new stub driver for OKLinux that enables the usage of a block-session device within Linux. Thereby, the old stub driver that provided a ROM file as block device is no longer needed and will be removed with the next release. A ROM file can now be supplied to Linux via the new ROM loop service. Tweaking the configuration of the lightweight IP stack to better fit Genode's application needs lead to a considerable improvement with respect to network performance. ISO9660 is the standard file system used on data CD/DVD medias. With the ATAPI driver ready, we implemented ISO9660 support on top of the this driver. The iso9660 server implements the ROM-session interface and can be used by any ROM connection. In order to take advantage of this new feature, we exploit Genode's new configuration concept and route the client's ROM service request to the ISO9660 server. The memory necessary to read a file from the ATAPI driver into memory is currently accounted on behalf of the ISO9660 server, not for the client side. Because of this limitation, it becomes necessary to equip the ISO server with a sufficient memory quota. The Ecma-119 standard requires support for 8.3 upper-case file names only. Because of this limitation, a number of unapproved ISO 9660 extensions have evolved (eg. Joliet, Rock Ridge). Since we don't see using 8.3 file names within Genode as an option, we added Rock Ridge extension support to the ISO 9660 server. Please make sure that your ISO-creation tool supports the Rock Ridge extension and enable it during ISO creation. We updated our port of the Qt4 framework from version 4.5.2 to version 4.6.3. Thereby, we changed the way of how the source code is organized. Previously, we maintained copies of modified files within the qt4 repository. Now, we keep those changes in the form of patches, which get applied to the contrib code when make prepare is issued within the qt4 repository. This change significantly reduces the size of the qt4 repository. We applied the same approach to the port of the Arora browser. Furthermore, the performance and stability of Qt4 and Webkit in particular have received a lot of attention, resulting in a much improved Arora browsing experience. The original distribution of the OKL4 kernel comes with x86 syscall bindings that use absolute addressing modes. Therefore, code using L4 syscalls cannot be compiled as position-independent code (gcc option -fPIC). Unfortunately, shared libraries must be compiled as position independent because the location of such a library's text segment is not known at compile time. Consequently, OKL4 syscalls cannot be issued by shared libraries, which is a severe limitation. The patch fixes the problem by changing all OKL4 syscall bindings and removing PIC-incompatible addressing modes. It does not affect the functionality of the kernel. The build system of the orignal OKL4 distribution is not prepared to compile ARM EABI binaries as generated by modern tool chains such as the Codesourcery GCC. The patch applies the needed changes to the OKL4 build infrastructure. Similar to the situation with the OKL4 kernel, we need to patch the Pistachio system-call bindings to enable syscalls from shared libraries. The corresponding patch is located at base-pistachio/patches and is known to work with Pistachio revision r782:57124b75c67c. Without applying this patch, the linker generates text relocation infos, which result in a run-time error of the ldso on the attempt to modify the read-only text segment of a shared library. Because we enhanced our dynamic linker to support ARM EABI, shared libraries are now fully usable with the Codezero kernel. With the previous versions of Genode, we took the approach to use the tool chains of the respective kernel to build Genode targets. For example, we used to rely on NICTA's ARM cross compiler (based on gcc-3.4) for building Genode for the OKL4/gta01 platform. Genode on Codezero, however, used the Codesourcery tool chain. We identified this approach as a dead end because we would need to support modern tool chains alongside ancient tool chains that are no longer used in practice. For accommodating the latter, we had to introduce special workarounds and make compromises. Because the original OKL4v2 distribution does not support modern ARM EABI tool chains, it cannot be used out of the box anymore. But you can find a patch to enable ARM EABI for OKL4v2 at base-okl4/patches/. We changed the build system to link all shared libraries with the –whole-archive option. All libraries are now built as position-independent code (compiler option -fPIC) by default. It is possible to explicitly disable -fPIC by adding CC_OPT_PIC= to the library description file. To ease the integration of third-party code into the Genode build system, we have added a mechanism for setting source-file-specific compiler options. Compiler arguments for a single file such as main.cc can be assigned by setting the build variable CC_OPT_main.